How Long to Cook a 4-Pound Top Round Roast at 350 Degrees? 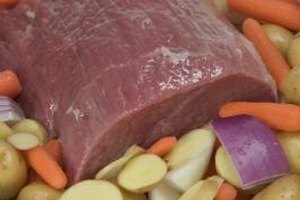 Can I Cook a Roast Beef for Three Hours at 200 Degrees in the Oven? To keep the cooking time under 3 hours for slow roasting, opt for a roast under 3 pounds. 3 How Long to Cook a 4-Pound Top Round Roast at 350 Degrees? Low-heat roasting is one of the best ways to cook a roast in order to get even cooking all the way through the roast and avoid overcooked or dried out ends. It is certainly possible to cook a roast in 3 hours at 200 degrees Fahrenheit, however whether this is enough time to fully cook the roast depends on a few factors including the type of roast, the size of the roast and your desired level of doneness. Some roasts are better than others for the dry method of low-heat roasting. Forget roasting altogether for cuts with lots of connective tissue like chuck roasts; these kinds of roasts are better for higher-moisture cooking methods like braising or stewing. Cuts that work well for roasting, in general, are already tender and flavorful on their own, including cuts like strip loin, sirloin and tenderloin roasts. Less expensive roasts that also turn out reasonably flavorful and tender with low-heat roasting -- but will still not be as flavorful as some of the more expensive cuts -- include boneless shoulder, top round and eye of round. While cooking times will vary according to the type of the roast you plan to cut, a general rule of thumb for cooking time for beef that's slow-roasted at 200 F is between 45 minutes and 1 hour per pound for medium-rare. Thus, if you wish to cook a roast in 3 hours or less, a whole prime rib is definitely out of the question. To hit 3 hours for slow roasting, it is best to go with a smaller roast -- about 3 pounds or less. If you plan to slow roast your beef at a low oven temperature, there are a couple of reasons why it's best to sear it first. First, with a low temperature of 200 F, the surface of the beef will not heat up quickly enough to kill surface bacteria on the meat within the safety zone of 2 hours. Second, searing browns the exterior of the meat, and this browning, knows as the Maillard Reaction, creates the deliciously savory and complex flavors we associate with properly grilled and roasted meats. Without browning, your roast will lack a considerable amount of flavor. To sear the roast, heat a large sauté pan or cast-iron skillet lightly coated with cooking oil over high heat on your stovetop. Once the oil begins to lightly smoke, place the roast in the pan. Sear the roast on all sides, turning as necessary with tongs, until dark brown. Many beef recipes and temperature charts give a “pull” temperature for beef that is typically around 5 to 10 F below the intended target finished internal temperature beef. This is due to a phenomenon called “carryover cooking.” Generally, when a piece of meat, especially a larger piece of meat like a roast, is removed from a heat source like an oven or grill, its interior will continue to cook for another 15 to 30 minutes. However, with a roast cooked at a temperature as low as 200 F, you should pull out the roast right at your target internal temperature, which would be 125 F for rare, 130 F for medium rare or 145 F for medium. What Are the Less Expensive Cuts of Roast?